If you're looking to enhance the bass in your home theater system, the Audioengine AS8 Powered Subwoofer represents pure sophistication in subwoofers. It features a linear port enclosure that minimizes excessive noise, down-firing 8" long-throw woofer with magnetic shielding, and a hand-finished, durable MDF cabinet enclosure. This powerful design enables this subwoofer to reproduce the tightest "punch" at the highest sound levels in its class. In addition, the AS8 features a 250W Class D amplifier, and a wide range of frequencies with superb sound quality and low distortion. It's stylish, compact design will complement the newest flat-screen Plasma and LCD TVs in your home theater set-up. A powerful 250W Class D amplifier makes this subwoofer an ideal choice for the most demanding of situations. This subwoofer utilizes a linear port and down-firing design that complements front surround systems and micro component systems. 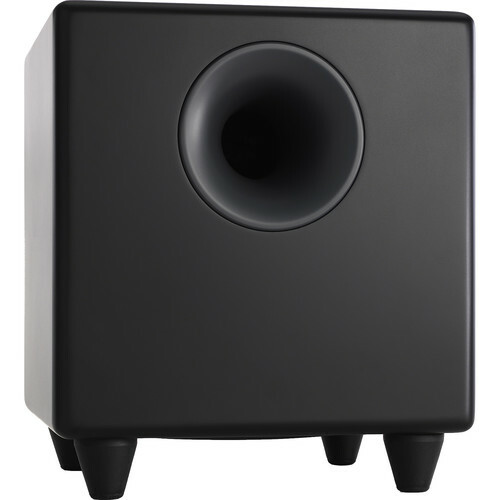 This subwoofer offers Output Current Limiting, Thermal Over-Temperature, and Power On/Off Transient Protection, which means sound reproduction will always be clean and as well defined as intended. If you decide to place this subwoofer away from your powered speakers or surround receiver, the optional Audioengine W1 wireless audio adapter or Apple's Airport Express offer the ability to incorporate wireless bass in your home theater system. Its housing is designed with magnetic shielding, preventing undesirable interference that causes distortion. Box Dimensions (LxWxH) 17.5 x 16.5 x 16.5"
AS8B Powered Subwoofer (Black) is rated 4.9 out of 5 by 7. Rated 5 out of 5 by Frank from AudioEngine Subwoofer Bought in on owners positive reviews. I felt my newly purchased Audioengine HD6's needed a little bass. It really adds to the sound. 5Stars for the S8. Definitely recommend it. Rated 5 out of 5 by S from Beautiful Quality Indescribable. I purchased it to go with the Definitive Technology Incline and it is flawless. It does not have the silly auto off function which is a nuisance for people listening to low volume audio a lot. The sound is so perfect and so adjustable it cannot be matched by many high end sub woofers I have listened to. This brand as well as Def Tech are top quality and fairly priced. It is expensive but fairly priced. It has plenty of power if you turn it up to shake the entire house and every floor. But I prefer accurate sound over excessive bass which is hard to find among the countless sub woofers available. Also packaging and white finish are beyond superb. Oh, and Audioengine A5+ and Def Tech Studio Series or Incline are excellent speakers to go with this. This is definitely a better sub woofer than the regular Def Tech ones unless it is the high wattage sealed ones in which case you would pay twice thus anyways. Any type of song or movie sounds incredible makes you feel like you are there. Bottom line, buy this before trying anything else because you won't have to! Oh, and be a responsible high end sub listener and get real cables like the monster gold plated or something. A DAC (high bitrate/sample rate audio card) is also a requirement for any quality audio component to sound good so don't skip out or you may not be hearing the same awesomeness I am hearing :). Rated 5 out of 5 by Brian from Thinking about buying a 2nd for my smaller pair Solid. Came very well packaged. Good instructions. Really nicely made. You should get it because the added low end will make you very happy. Rated 4 out of 5 by Pranav S. from Great lows in an 8" package I had the Kef Eggs, just wanted some subwoofer to fill the gap, the color goes with my white eggs, and the bass is good enough. Quite happy with the setup. Rated 5 out of 5 by Anonymous from Perfection Already had the A5 powered speaker pair... this is the perfect addition. after adjusting settings to fit the room.. blown away. Rated 5 out of 5 by Nick from Audioengine AS8B Powered Subwoofer Provides the added bottom end punch to the HD6s. Sounds great. It says in the description that the sub is Wireless capable. Is that mean that I can connect it to the Audioengine HD6 wich is at the oposite of the room without any cable? does this model version have flat feet? The bottom of the legs are flat. Does that 11.25 height measurement include the feet/spikes or not? If not, are they removable? My box has the pointed legs on and it measures 13 3/4 inches tall. Not sure you're supposed to remove the legs, but I'm pretty sure you can. PS sounds and works great!